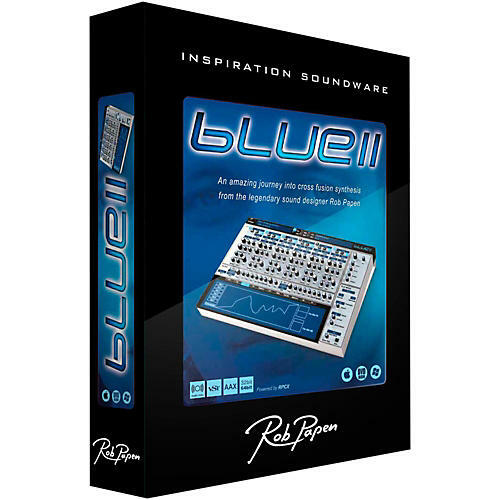 This version will upgrade existing users of Rob Papen's BLUE to BLUE II. First released in 2005 BLUE already reflected Rob Papens cutting-edge, creative, and ” most importantly ” musical approach towards developing virtual instruments by first delivering FM and subtractive synthesis, then duly adding Phase Distortion and wave shaping synthesis into the highly creative mix to create one seriously creative combination. Rob Papen himself called it ˜Cross-fusion synthesis since it covered so much musical ground so effectively. Today BLUE-II remains true to that ethos with even more sound dimensions and features to its extended name, starting with six oscillators beating at its musically creative heart. These can be connected in various ways, together with two analogue-style modelled stereo filters with 27 different filter types, an enormous range of processing and modulation options, sequencer, and an incredibly powerful arpeggiator. A new range of specially selected waveforms based on samples have been meticulously fashioned for creating new and fresh-sounding synth sounds, so dont go expecting acoustic pianos galore here. However, since choirs and strings are an excellent basis for so many synth sounds BLUE-II has them in abundance ” with much more besides! Moreover, BLUE-II takes the useful XY pad features from its popular virtual instrument sibling Blade ” a cutting-edge additive synthesis powerhouse with a human touch ” and transplants them into its own equally extraordinary workflow¦ perfect for time-based sound movements and vector pad-type sounds. Complemented by four top-quality FX processors, each offering 35 FX types, BLUE-II is a phenomenally powerful virtual instrument to behold.